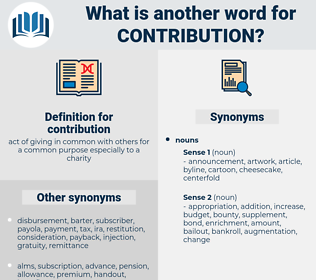 What is another word for contribution? Levies, DUES, contribute, contributing, participation, Contributed, contributes. data, collaboration, proportion, factor, contribute, consideration, infusion, cooperation, compensation, difference, participation, injection, effort, portion, counterparty, competition, cost-sharing, communication, presentation, influence, achievement, bit, co-operation, counterpart, appropriation, addition, devotion, impetus, measure, way, contest, element. Helped, matched, utilized, shaped, activated, made, Contributed. 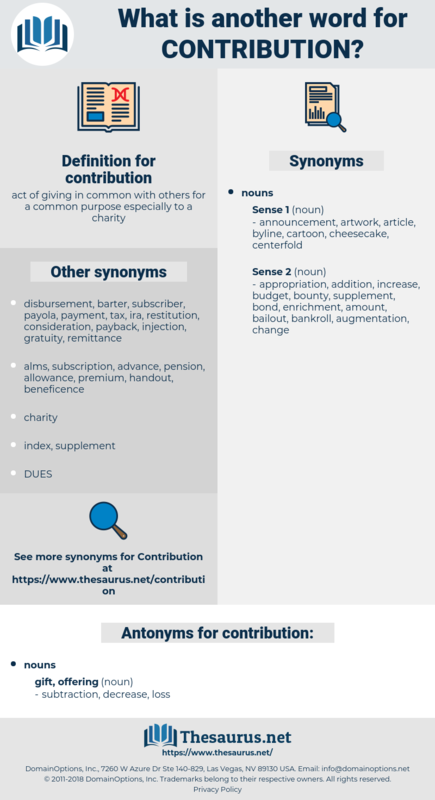 brings, exceeds, contribute, contributing, contributes. Perhaps the most significant contribution of the farmers' movement to American politics has been the training of the agricultural population to independent thought and action. The volume forms a contribution singularly valuable in its own way to the learned literature of English social history. attempt, endeavor, effort, try, endeavour, publishing, publication. amount of money, sum of money, sum, amount.